Archives : DOWNWARD BIAS CONTINUES - 01/10/2014. DOWNWARD BIAS CONTINUES – 01/10/2014. 7850 – 8150 : NIFTY TRADING RANGE. It was a short, truncated week where the trading remained range bound but with increase in volatility. Tuesday was a volatile day as the market shrugged off RBI’s neutral stance on key policy rates. Though the market rose just after the release of RBI policy, but all the gains were erased after the policy review pointed out that upside risks to inflation target of 6%, remain. Thus the Nifty continues to move in a trading range of 7850 on the lower side and 8150 on the higher side but the bias remains downward. Sensex opened the week at 26694, made a high of 26851, low of 26481 and closed the week at 26567. Thus it closed the week with a loss of 59 points. At the same time the Nifty opened the week at 7978, made a high of 8030, low of 7923 and closed the week at 7945. Thus the Nifty closed the week with a loss of 23 points. Both the daily and weekly charts have formed small black body candles in line with the short term bearishness. Sensex has formed a small black body candle on the daily charts which completely engulfs previous day’s small white body, but it cannot be termed as a Bearish Engulfing as it has formed in downtrend and also both the bodies are not real body candles. 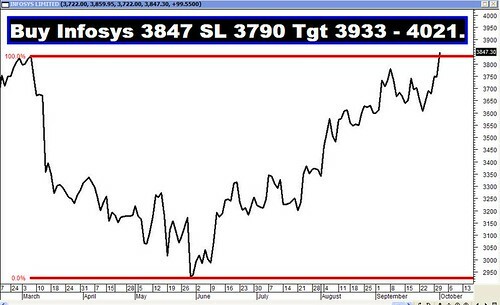 In the immediate term, the markets are correcting the upward rally from an immediate low of Sensex 25232 and Nifty 7540 to a high of Sensex 27354 and Nifty 8180 and the relevant Correction levels are at Sensex 26544-26293-26043 and Nifty 7935-7860-7784. Last week both the indices managed to bounce back after taking support at the 50% Retracement level. On the lower side, there exists a critical Bullish Rising gap on the daily charts between Sensex 25437-25406 and Nifty 7598-7592 which aided by an intermediate bottom (Sensex 25232 and Nifty 7540) and 38.2% Retracement of the intermediate rally (Sensex 25415 and Nifty 7591), forms a strong confluence zone. Thus this confluence zone formed between Sensex 25437-25232 and Nifty 7598-7540 will act as Support Zone. This week, both Sensex and Nifty have managed to remain above the medium term average of 50dma (Sensex – 26438 and Nifty – 7904). Whereas both the indices continued to remain below the short term average of 20dma (Sensex – 26878 and Nifty 8044) and remain well above the long term average of 200dma (Sensex – 23581 and Nifty – 7037). Thus the trend in the short term remains down, whereas the trend in the medium term and long term timeframe continues to remain bullish. MACD and ROC both continue with their Sell signals. RSI continues to remain below the equilibrium line at 46, suggesting bearish momentum. MFI even though has moved higher but still remains below the centerline and is at 43, suggesting money flowing out. ADX has reduced further to 22, suggesting a further decrease in the strength of uptrend. Directional Indicators continue in Sell mode as +DI remains below –DI. OBV continues in sideways mode but is yet to make a lower bottom. Bollinger band continues with its Sell signal given last week. Thus Oscillators are suggesting a bearish bias in the short term. Option data suggests that highest Put Open Interest build-up is at the strike of 7800 and highest Call build-up is seen at the strike of 8200. Thus Option data suggests short term trading range with support coming in at 7800 and resistance around 8200. On Friday, 7500 Put has seen strong Open Interest buildup which suggests next strong support below the level of 7800. Strong Trendline Support for the Sensex is at 26381. Trendline Resistance for the Sensex is at 27798. Strong Trendline Support for the Nifty is at 7861. Trendline Resistance for the Nifty remains at 8323.